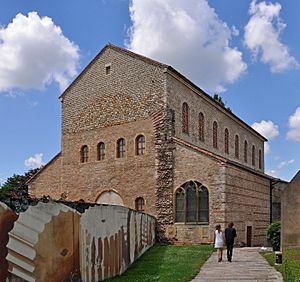 The Merovingians were a dynasty of Frankish kings who ruled in the region of ancient Gaul (more or less modern France), from the fifth to the eighth century. They were sometimes referred to as the "long-haired kings" (Latin reges criniti) by people of the time, for their symbolically uncut hair (traditionally the tribal leader of the Franks wore his hair long, while the warriors trimmed theirs short). The term is drawn directly from Germanic, akin to their dynasty's Old English name Merewīowing. The Merovingian dynasty owes its name to the semi-legendary Merovech (or Merowig, sometimes Latinised as Meroveus or Merovius), leader of the Salian Franks from c.447 to 457. Clovis I went on to unite most of Gaul north of the Loire under his control around 486, when he defeated Syagrius, the Roman ruler in those parts. 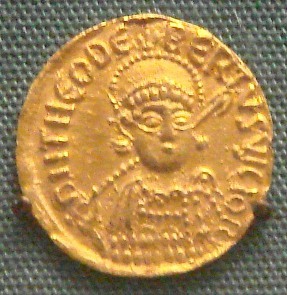 Coin of Chlothar II, 584-628. British Museum. Triens of Dagobert I and moneyer Romanos, Augaune, 629-639, gold 1.32g. Monnaie de Paris. Merovingian dynasty Facts for Kids. Kiddle Encyclopedia.